A ceremony marked the induction of the first eight members into the hall of fame, and National Business Aviation Association President Ed Bolen gave the evening’s keynote speech. AOPA Central Southwest Regional Manager Yasmina Platt attended the event on behalf of the association. The San Antonio Aviation and Aerospace Hall of Fame is the product of collaboration between the Dee Howard Foundation, the Partnership for Corporate Aviation Training, and other partners. 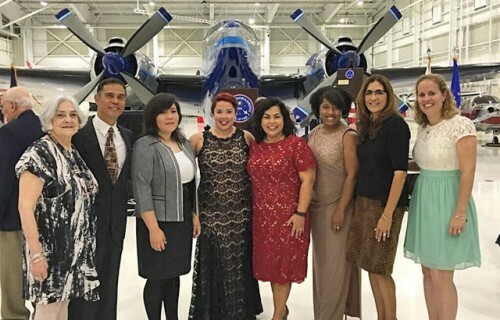 The Dee Howard Foundation was established in 2013 “to build on the legacy of legendary aviation pioneer and entrepreneur Dee Howard by preserving the rich history of aviation in San Antonio of which [Howard] was a part,” according to the organization’s website. Also in attendance at the inaugural gathering at the Valero Energy hangar at San Antonio International Airport were San Antonio Mayor Ivy Taylor; Mario Calzada, mayor of El Marquez, Queretaro, Mexico; former San Antonio Mayor Phil Hardberger and Linda Hardberger; San Antonio City Council members Joe Krier, private pilot Roberto Trevino, and general aviation supporter Rebecca Viagran; San Antonio City Manager Sheryl Sculley; and other dignitaries.